A young man who wants to become a Civil Engineer, T.C. Akio Jr. Yoshida, is Robert Louis Stevenson School’s dux for 2017. He was among many students congratulated for a fine academic year in 2017 during the school’s prize giving yesterday. T.C. has paternal links to Ichinomiya, Japan and maternal ties to Tufutafoe, Vaitele Fou, Afega, Asaga and Faleatiu. The 16-year-old is the second child of Tuimaualuga Misi Park Yoshida and Fa’aafu Taleasaasa Matafeo-Yoshida’s four children. Science is one of his favourite subjects. “I took Science because I have always loved it ever since I was a little boy,” he told the Samoa Observer yesterday. Asked if there were there times during his journey that he felt like giving up, he replied no. “I have a saying that I like to keep holding on too and that is hard work beats talent and if you think you cannot beat someone because they are more talented than you are, then you’ve already lost, so just keep on working hard,” he said. “I would have to say my parents especially my father because I learn all my ethics from him,” said TC. “He is a Science person too so I take after him with my love for science. “I want to become a future engineer. “It’s one of the toughest subjects but it is also one of the most interesting and fun careers too. What next for the young Dux? 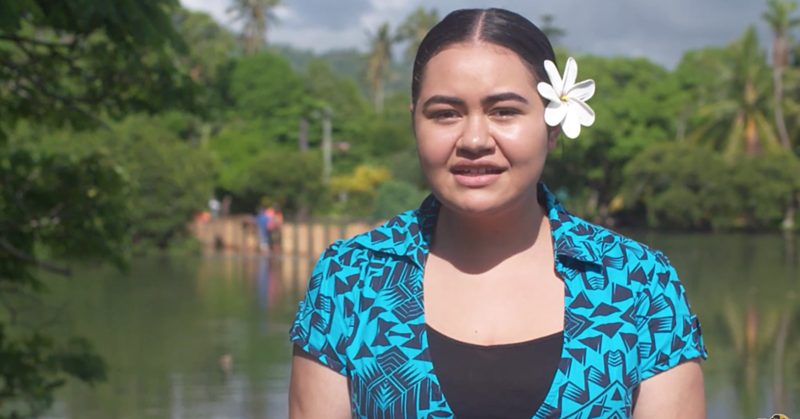 “I’m aiming to be accepted in the National University of Samoa and hope to get a scholarship to any university overseas so that I can fulfil my dreams and goals,” he said. “But I just want to encourage the young ones to stay true to themselves. “Don’t give up easily and remember that hard work always beats talent. “And for today all glory and praise to God. He acknowledged his pastor Siolo Tauati, family members and teachers who taught him at R.L.S. and most especially his parents. Fa’aafu expressed tears of joy when she was asked how she felt about her son’s achievement. “I was speechless for a whole two to three minutes,” she said. “I knew it was there but it’s just the feeling of it. “There are no mixed emotions except just being thankful that T.C. has achieved this milestone not only for the school, but also for our family. “It’s a wonderful feeling that my husband and I will share even though he wasn’t able to make it but I know he is very proud of his son. “T.C. deserves this simply because he works very hard. “This is a student who drinks coffee and then hit the books and I’m the one who makes his coffee. He would finish studying around 4 o’clock in the morning. “Sometimes he would go right up to the morning around 6 o’clock and then he gets ready and goes to school so he works very hard. “His father always tells him that hard work always overcomes talent. “You may have a God-given talent, but if you don’t work hard you don’t get anything. “As a mother and a teacher myself, I was not strict on him but I just ensure that T.C. is disciplined because self-discipline is very important. 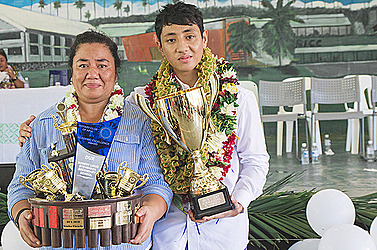 Fa’aafu was overjoyed not only for her son, but for her daughter who also took first place in Level 3 visual arts and second place in mathematics. “I didn’t expect my daughter to do so well, but with my son I did,” she said. “With my daughter I was blessedly happy and surprised and all in all, all the glory belongs to God for wisdom and knowledge that He has bestowed in the children.